within Human LZP aa 450 to the C-terminus. The exact sequence is proprietary. Human plasma, Human fetal liver and HepG2 lysates. 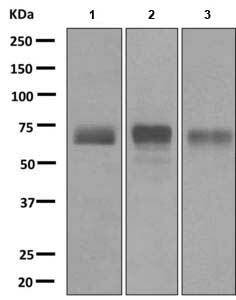 Permeabilized HepG2 cells. Our Abpromise guarantee covers the use of ab172973 in the following tested applications. WB 1/1000 - 1/10000. Predicted molecular weight: 60 kDa. LZP contains one EGF-like domain and one ZP domain. It may be involved in hepatocellular function and development. LZP is liver-specific and is expressed only in the hepatocytes; down-regulated in hepatocellular carcinoma (HCC) and HCC cell lines. There are two named isoforms. Nucleus envelope. Can be secreted into blood. 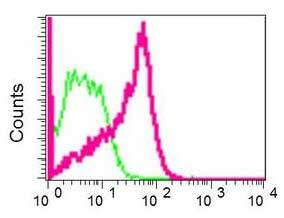 Flow cytometric analysis of permeabilized HepG2 cells labeling LZP with ab172973 at 1/100 diution (red) or a rabbit IgG (negative) (green). ab172973 has not yet been referenced specifically in any publications. Publishing research using ab172973? Please let us know so that we can cite the reference in this datasheet. There are currently no Customer reviews or Questions for ab172973.